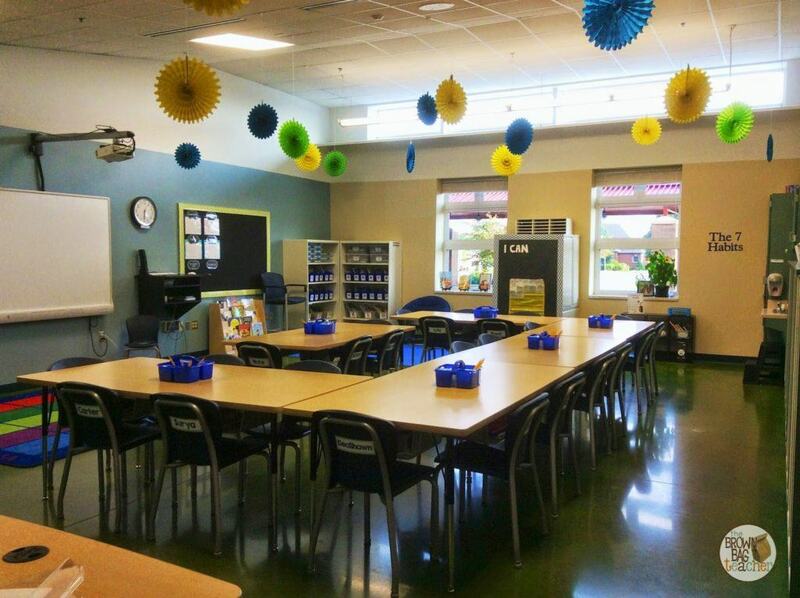 Let me start by saying, this classroom is beautiful. Not what I’ve done to it, but the physical space. I have four REAL walls (last year I had partitions), 3 huge windows that allow us to work without the lights on, and 4 normal-colored walls (not yellow and red). Plus, it’s about 1/4 larger than my room last year for 7 less children. It’s AMAZING. 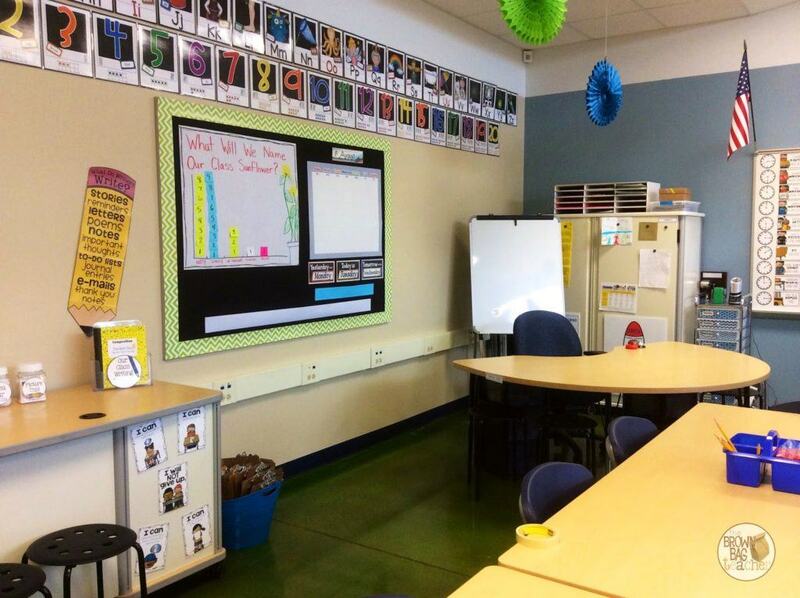 As you walk in the room and turn left, you’re greeted by our writing center. 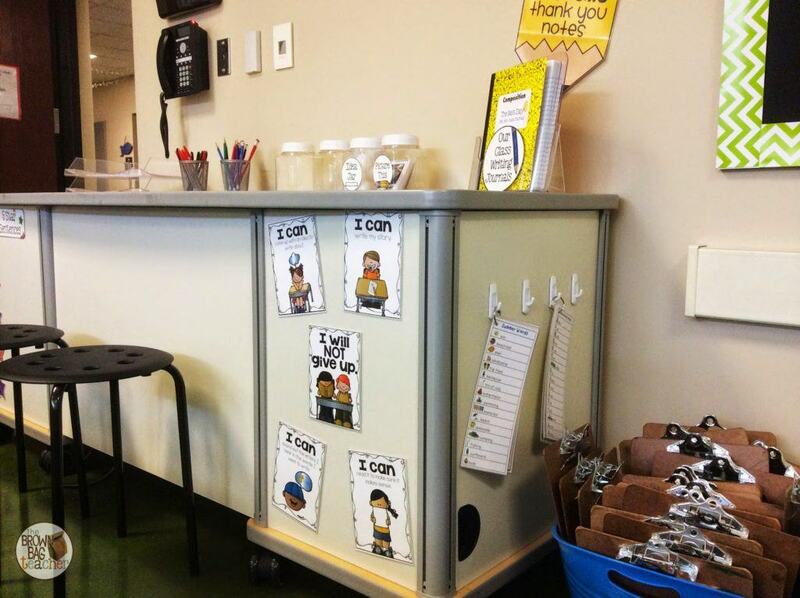 A transformed teacher desk (desk drawers facing the wall), this makes the perfect writing area. The magnetic sides of the desk are perfect for hanging materials or sticking Command Hooks. 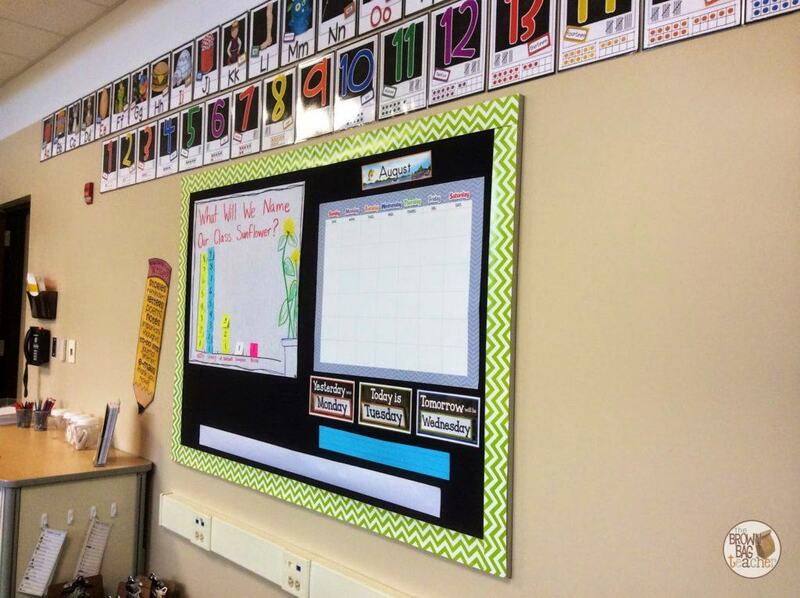 Plus, the large surface will be great for holding our writing materials and the open space above the desk will be perfect for showcasing our anchor charts. 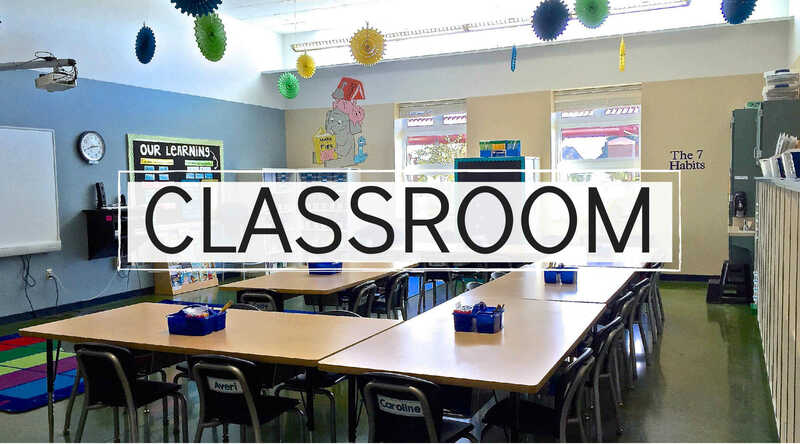 Although we’re a week and a half into school, this is one area of our classroom we’ve yet to explore. The anticipation is killing us, but we are going to hold out for another 2 weeks or so. Right now, we are focusing our writing juices and efforts on Oral Writing. 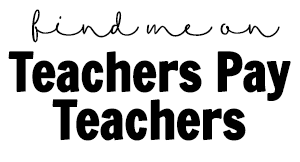 Kristen Smith’s “Work on Writing” I Can statements are perfect for encouraging my students and keeping us focused. 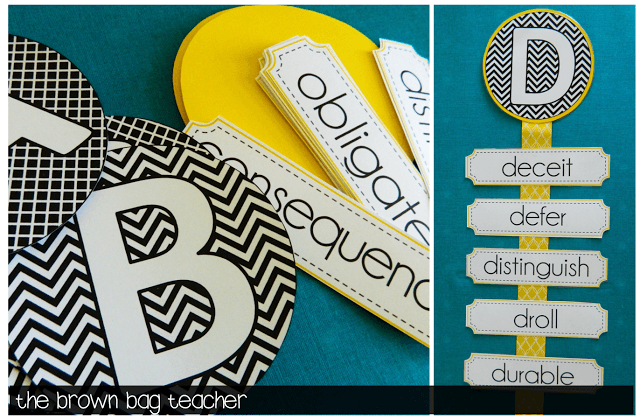 On the side of the desk, you’ll noticed command hooks for word/vocabulary rings. I love Renee Dooly’s Word Cards for Littles. To begin our year, I’ve only included a few of the cards on the rings – summer words, school words, sports words, emotion words. As we continue through the year, I’ll keep on adding words to the rings! 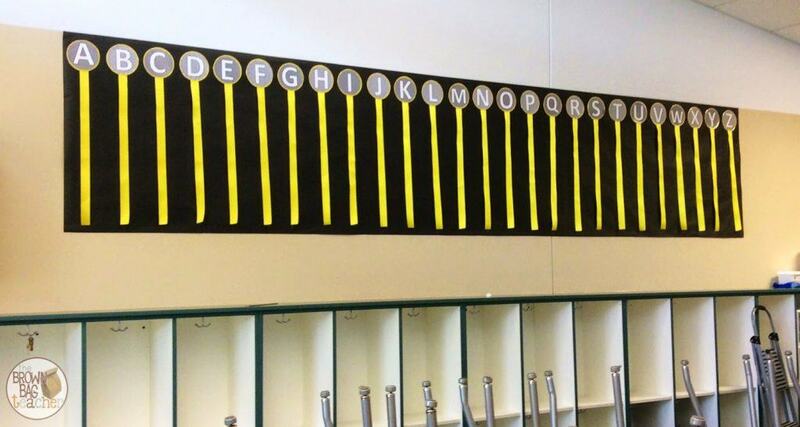 On this side of the room, we also have our classroom alphabet and number line. In May, I fell in love with Jenn Jones’ alphabet and *needed* a matching number set. Friends, Jenn truly outdid herself! 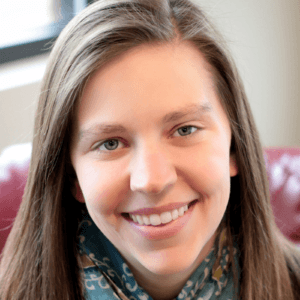 She spent days working on a fantastic pack of resources and the numbers match the alphabet perfectly. The colors are so vivid and it really does look fabulous. In this corner, I also have my teacher table. 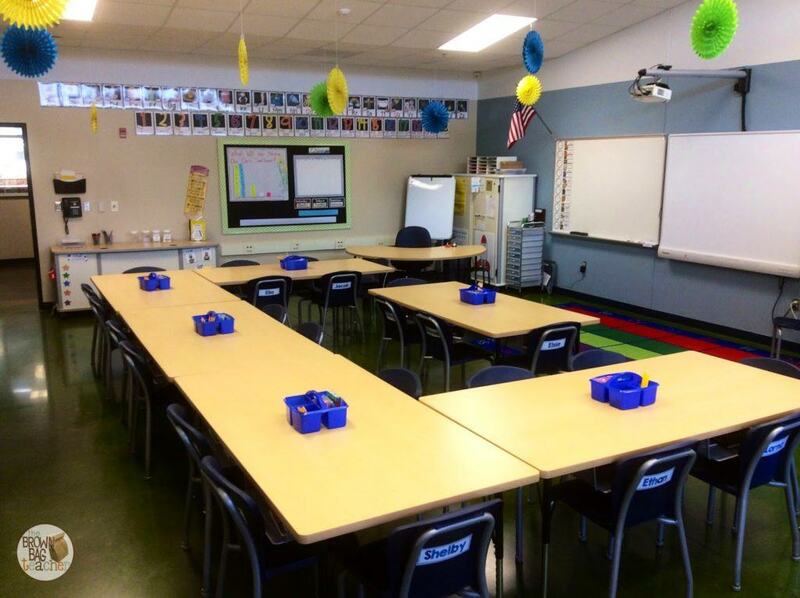 I use stools from Ikea for student seats because they take up zero room, and they are perfect for wigglly 1st graders! 😉 I have two black, Sterilite drawers under each end of the circle table. 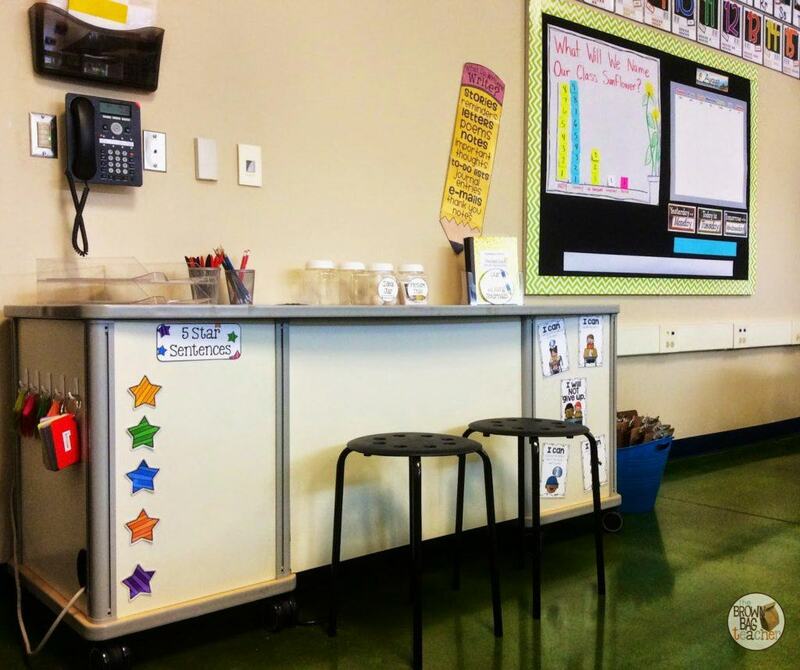 One set of drawers is my traditional ‘teacher desk’ and the second set holds my small group materials – blue (high), yellow (medium), and green (low) groups. 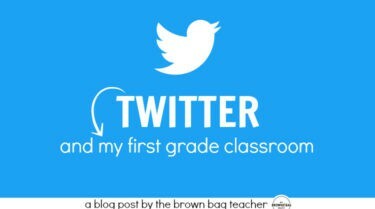 This is the ‘front’ of my classroom. 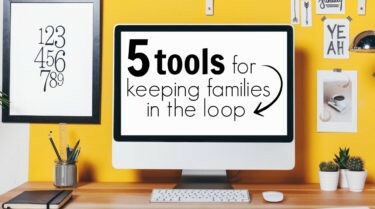 Being in a brand new school (only 2 years old), we are blessed with awesome technology – a Promethean Board, document camera, classroom computer, teacher computer, student laptop, 3 iPads, and a Mac Mini. It’s definitely not 1:1…but I’ll get there someday! Another HUGE blessing was the classroom rug that was provided by my school. 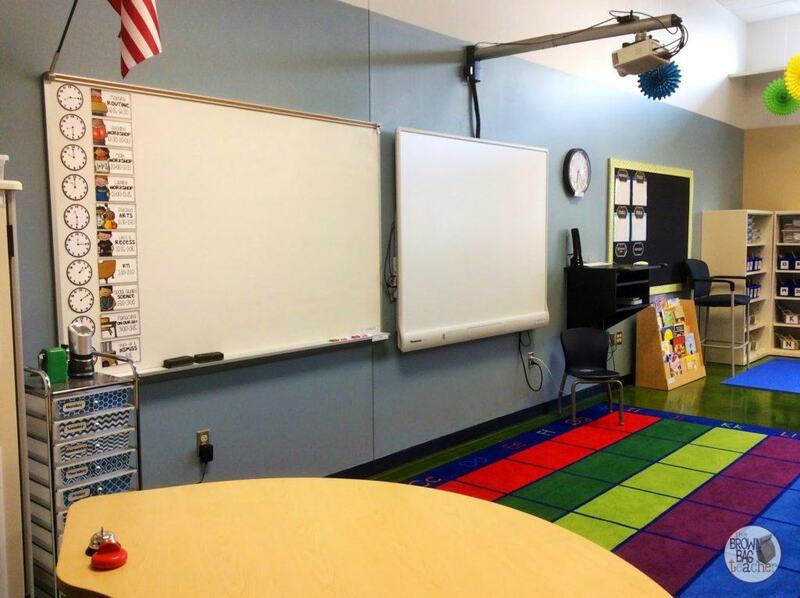 This saved me over $300 and makes a perfect morning meeting space! On the left I have my 10-drawer rolling cart from Sams. 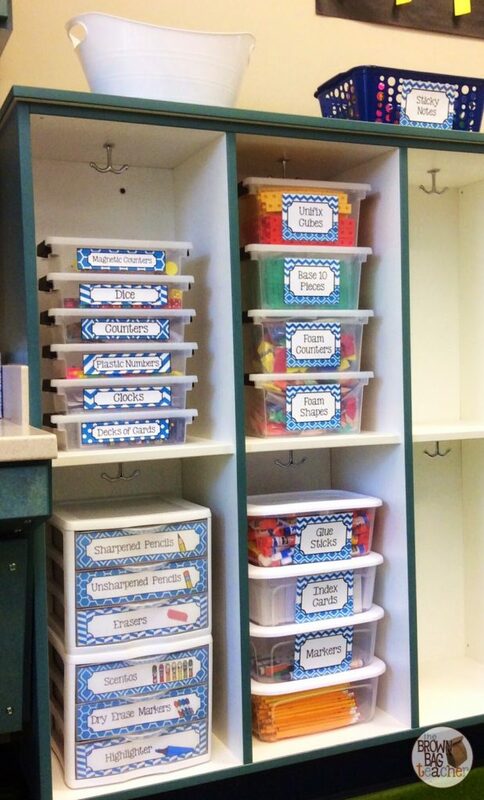 This is where I keep my materials for the week and anything I have for parent/volunteers. All I had to do was change out the labels from last year! 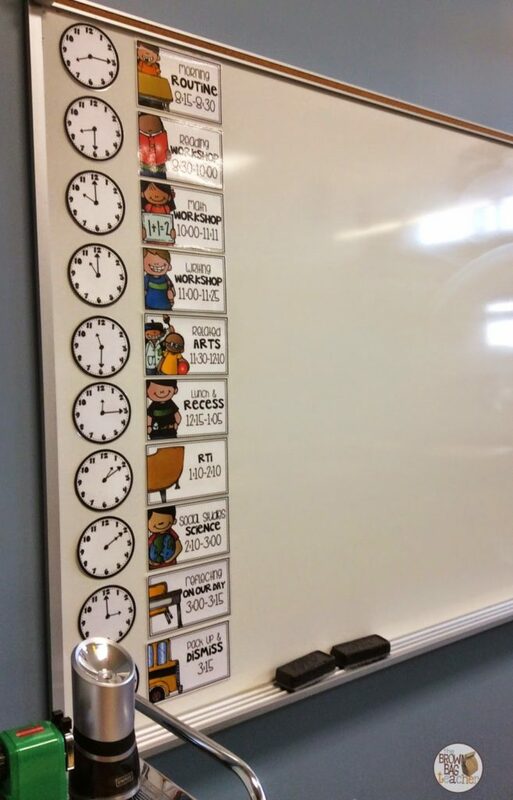 I’m loving Amy Groesbeck’s daily schedule cards accompanied with Zip-a-Dee-Doo-Dah’s clock faces. I added these Ahesive Magnet Dots to the backs, so I can change things in/out easily as school-wide events come up or we flip-flop our schedule. Walking around the room, we have our Reading and Library area. 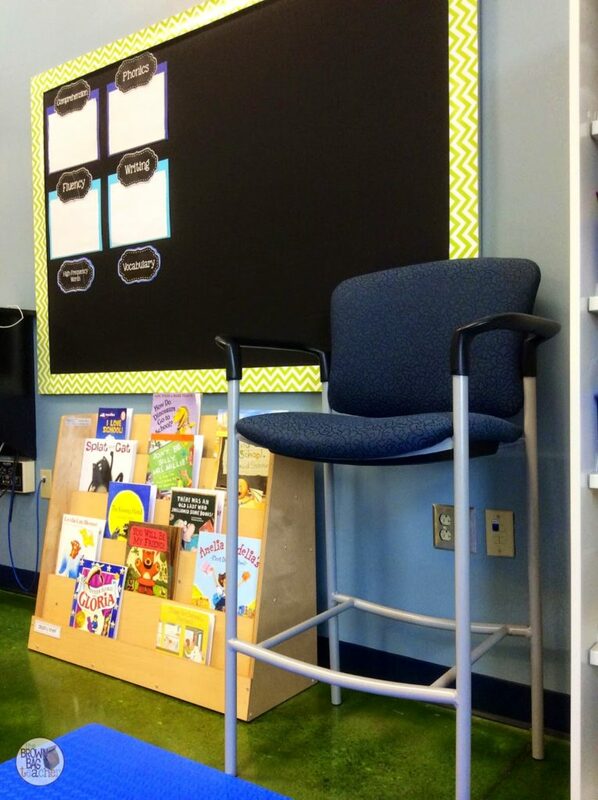 Complete with a ginormous Sharing Chair (provided by my school), a circle chair, and rubber floor tiles , this is one of our favorite spaces. 🙂 This year, I’ll be using curriculum for the first time. 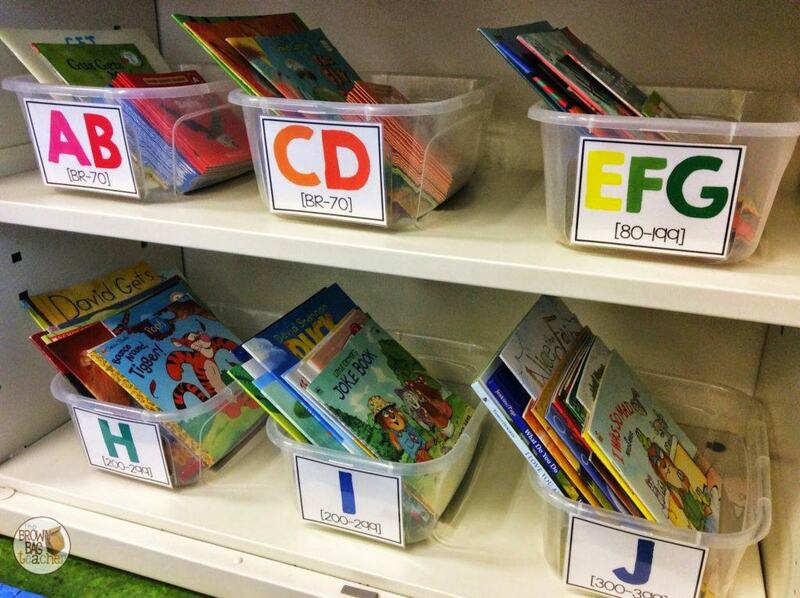 For reading, we’re using Reading Street, so I have my focus-wall headers up: comprehension, phonics, fluency, writing, high frequency words, and vocabulary. 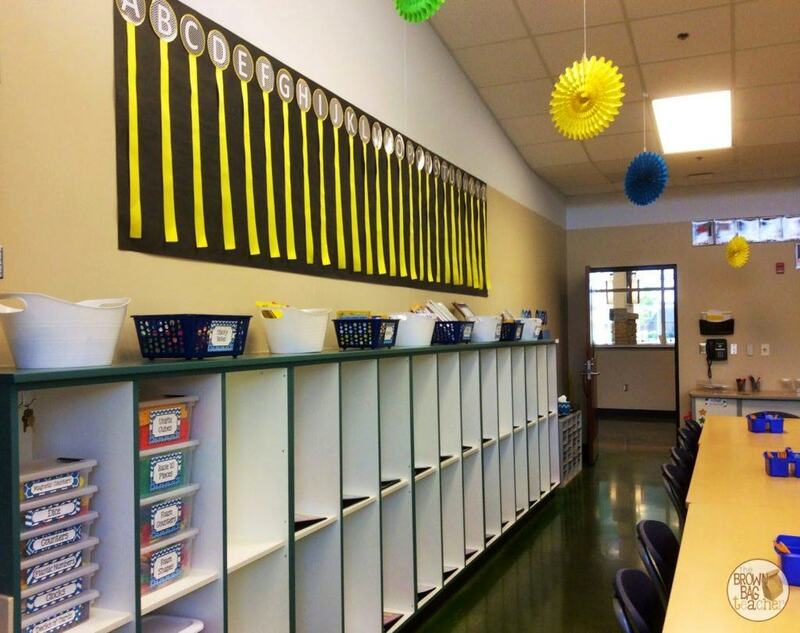 Then a great space for anchor charts! This is our library nook, and we started using it the very first day! My kids know our most important goal is to become better readers, and they’re excited. As a less-expensive, easy-to-clean, carpet alternative, I purchased rubber floor tiles on Amazon for our space. I so excited to say they’ve worked perfectly! 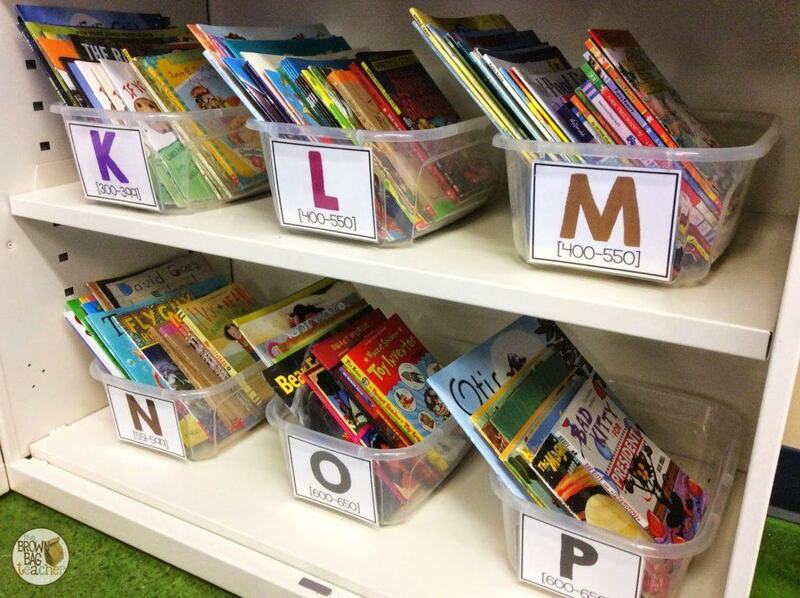 The two bookshelves provided by my school hold our read-aloud, seasonal books for our wooden book display, student book bins, and our leveled library. You can snag the labels here. 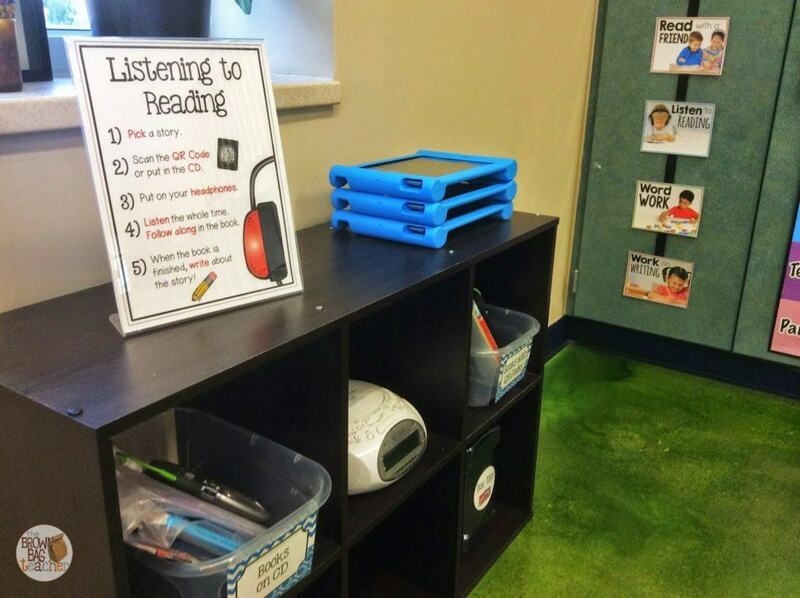 Backing up to our library area, we have our listening center area. Acting as a barrier between the two, I backed up 2 large file cabinets (so large I require a ladder to read the top drawers, by the way) against one another. 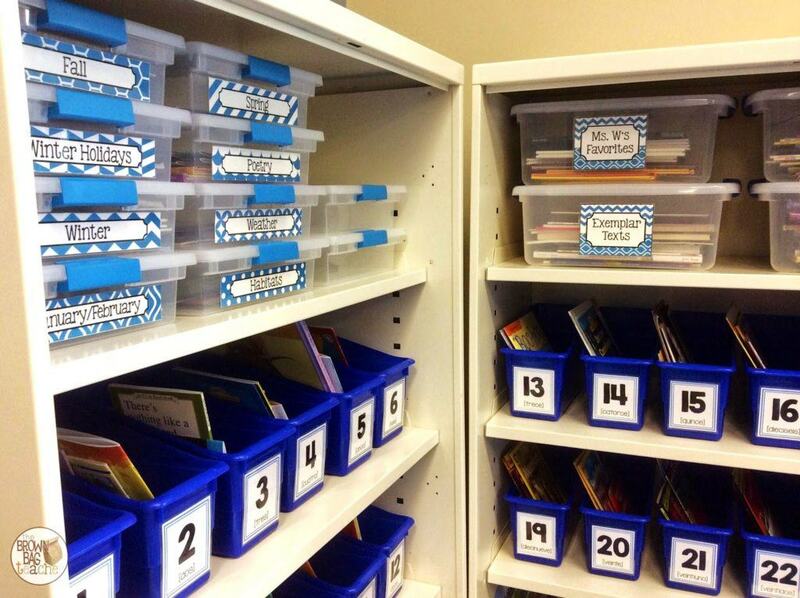 This gives me access to both, but still allows me to use the front for student-work space. 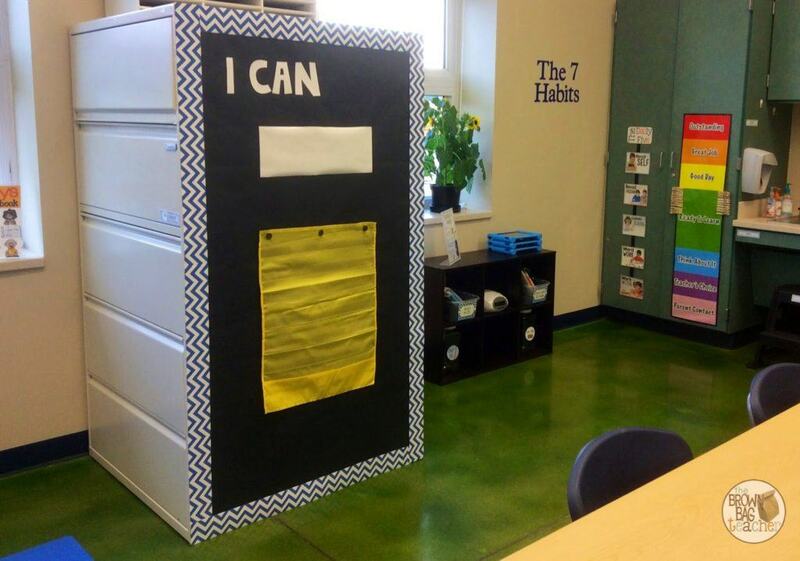 I covered the sides with black bulletin board paper, Creative Teaching Press border, MTF Jumpin’ Jack “I Can” letters, and then, laminated a piece of white card stock for our “I can” statement. 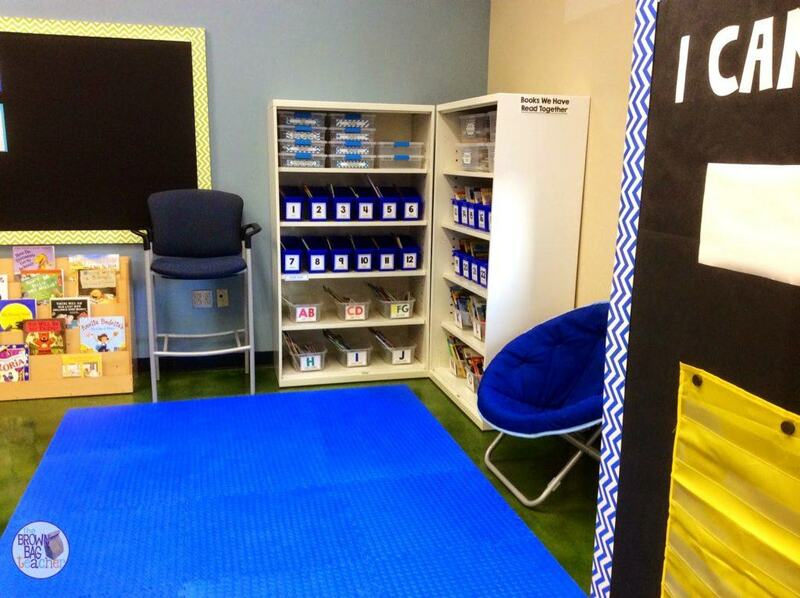 This will be the perfect space for hosting sorting pocket charts, magnetic letters, and number lines. 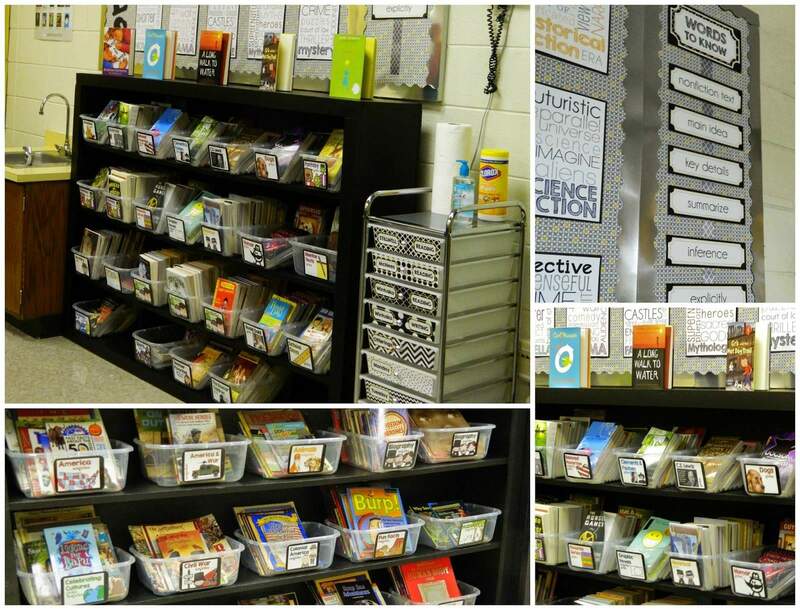 We are a PBIS and Leader in Me school, so you see our clip chart in the corner along with a space for our 7 Habits posters as we introduce/learn about them each week during theme! This is all next to our SINK and WATER FOUNTAIN?!?!? I know! 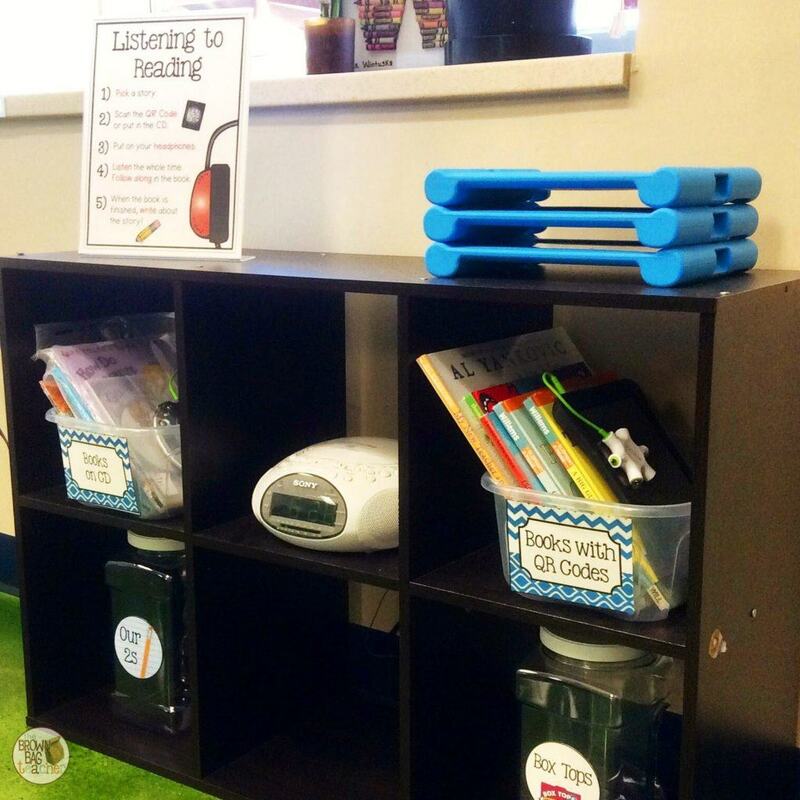 Our listening center functions in two main ways – Books on CD (yes, we rock a 1990’s CD player), and QR codes. I purchased 2 Belkin Headphone Splitters , so up to 5 students may be listening to a book at a time. 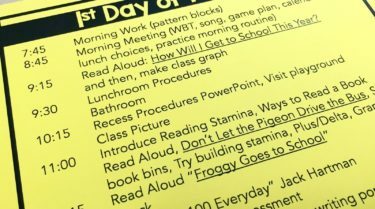 The visual directions help keep us on track and have been a great reminder as we launched Listening to Reading this week! You may grab the Listening Center poster here. Here is a picture of our word wall right after it went up. This is actually the same word wall I used last year. Obviously, I’ll be adding different words but am excited to reuse the headers and ribbon. You can see more pictures and it’s unveiling in this post! 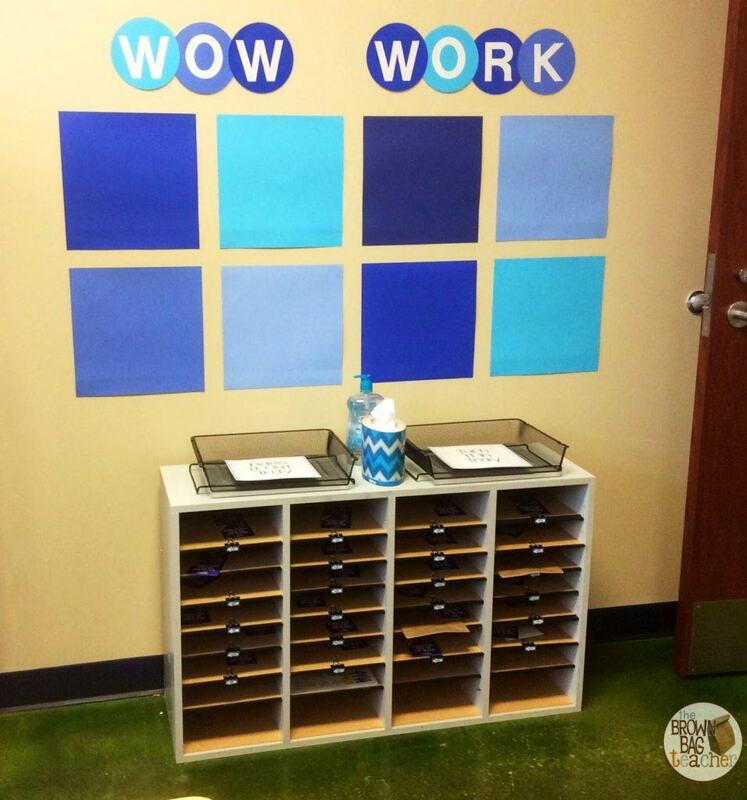 Lastly, welcoming guests into our classroom is our ‘Wow Work’ display. 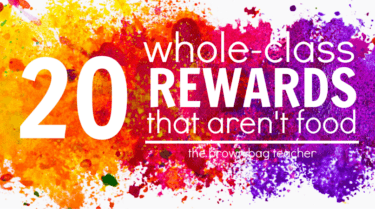 While I’ll have a more formal space outside for every student to showcase work, our in-classroom display is perfect for highlighting small victories. 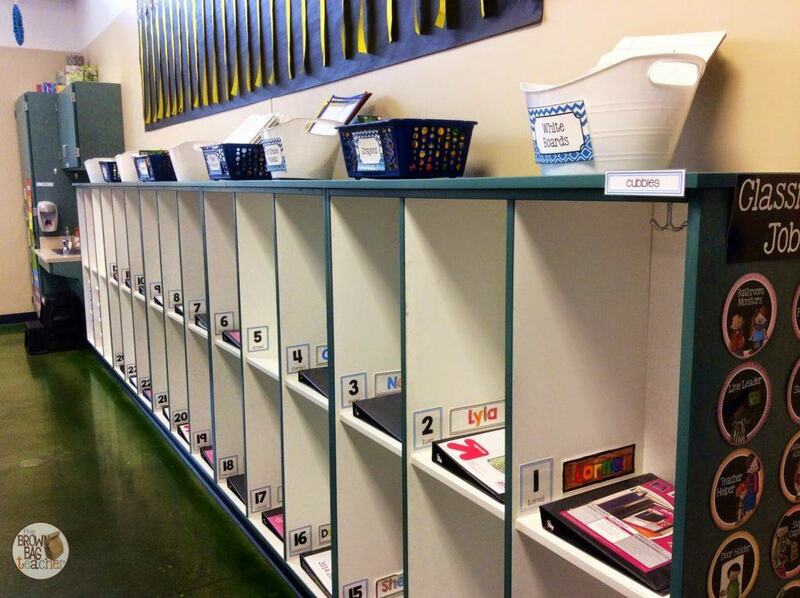 This is one thing I really missed not having last year, so I was thrilled to find space for it over our mailboxes. How are your table groups working? I'm intrigued by the way you arranged them and that some students have their backs to the board. Do you find students off task a lot by the large groups? Your room is beautiful!! A few years ago, my old classroom had partitions. It wasn't fun! Have a great year!! It's beautiful! I love how everything coordinates and is organized! 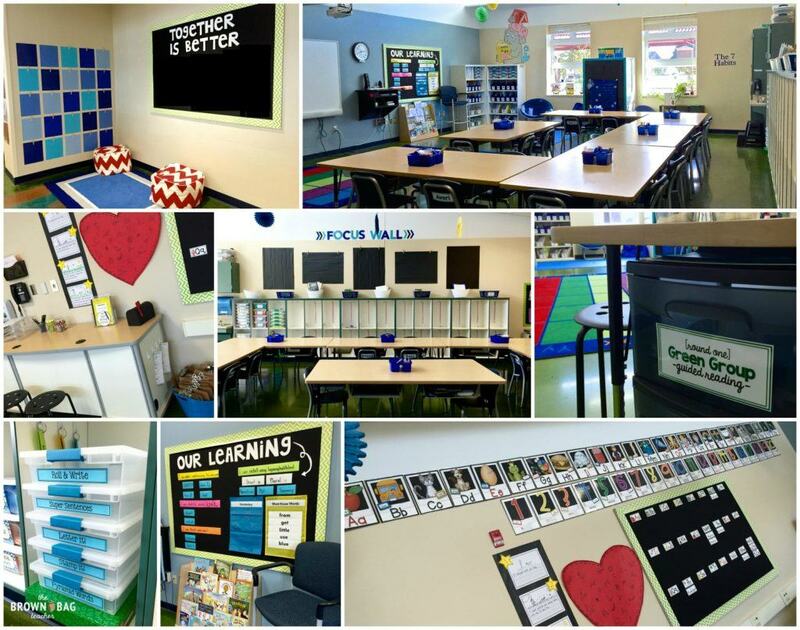 Clearly, a lot of thought, effort and work went into your classroom! Your kids must love it! Your room looks great! 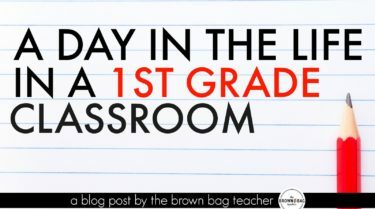 I have the same point of view as you- I want my room to look clean and organized so I can add student work. I'm not big on having a theme either. I can tell you worked very hard. Have a good week! I love how organized everything is!! That's my goal for this year! 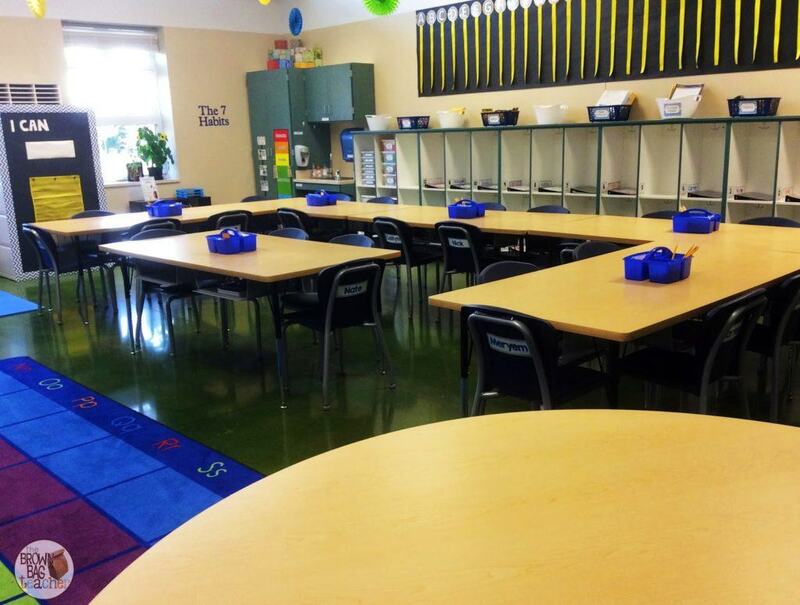 For a primary room, it's SO clean! I loved how you used your cabinets for wall space. I'll probably end up doing that for my cabinet by my desk. It's adorable 🙂 Good luck with your firsts! You're gonna love the land of primary! 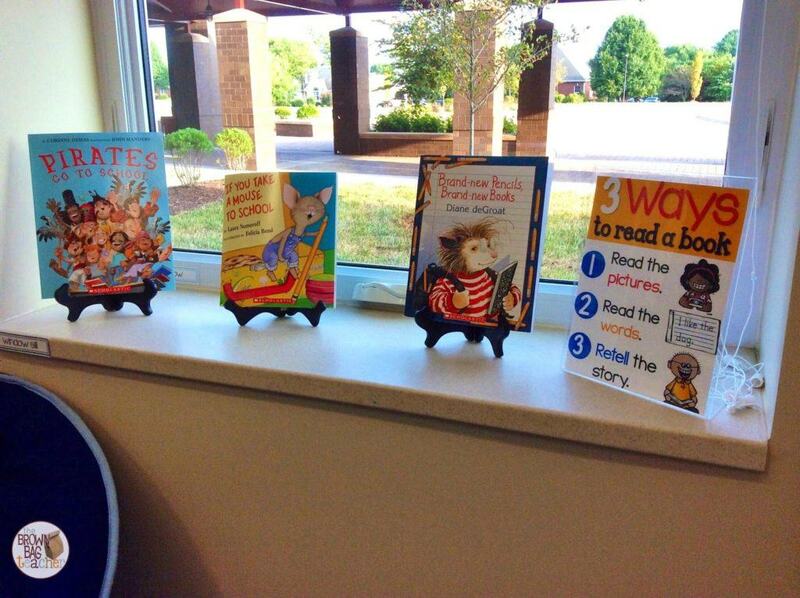 Catherine- Where did you get the "3 Ways to Read a Book" printable?? I love it & would love a link! Is it for sale on TPT? Your room looks amazing! 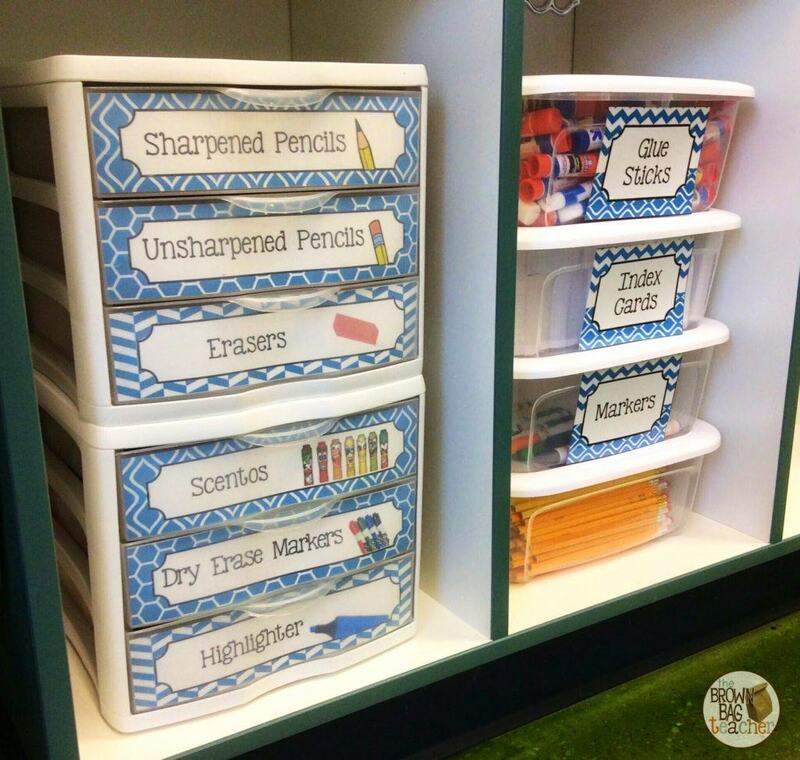 Organized and clutter free! Here's wishing you a most wonderful year…enjoy the ride! 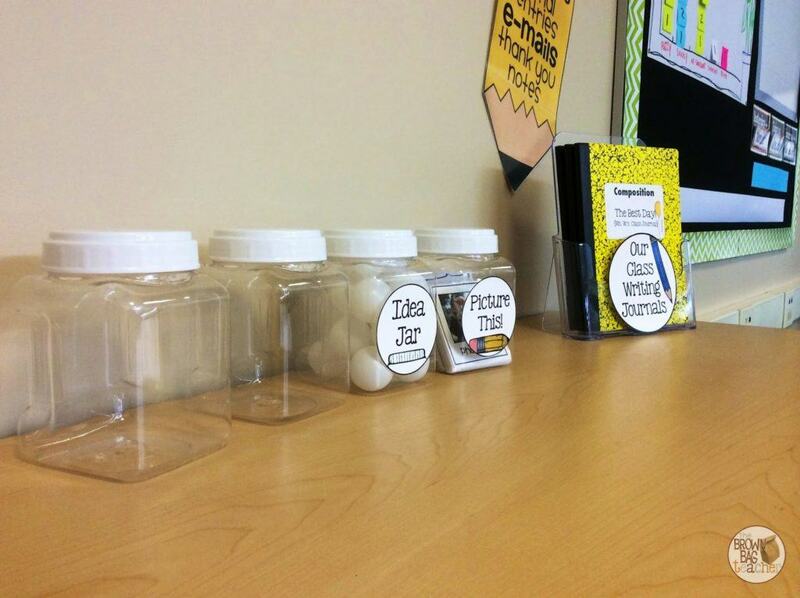 I am intrigued by the picture tub in your writing center. Are those Polaroids? Or just made to look like them? 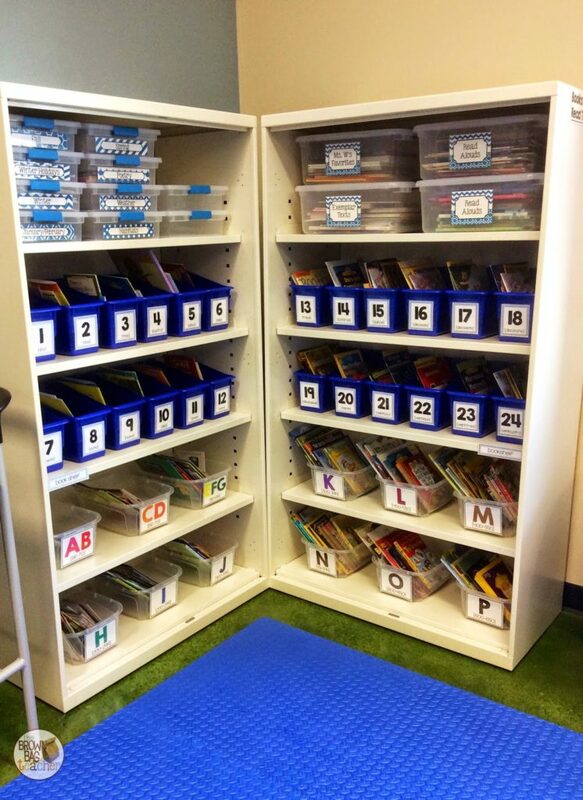 Where did you get the blue pattern labels, labels that are inside the cubbies, and the labels in the reading nook where the leveled readers are? Do you sell the edible signs you use to label all the bins. 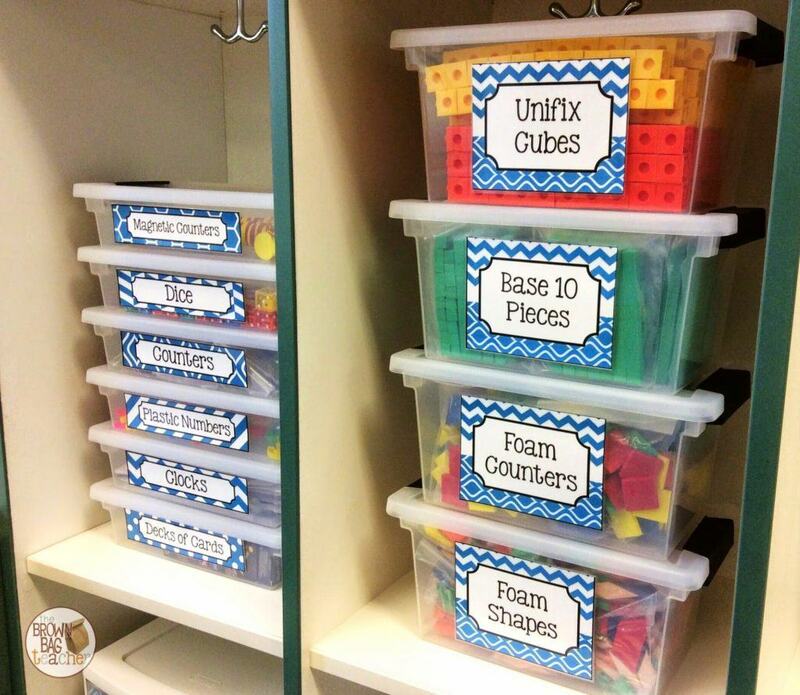 I'd love to purchase printable signs to labels my draws and bins with pencils , glues, cubes etc. As well as name things around the room on smaller cards with a neat colorful pattern. Where can you purchase them? Thanks Donna Renieris. Renieris2@optonline.net. I'm going down to first this year and would love these please send reply to renieris2@ optonline.net address as this is linked to my daughter's email not mine. Thanks.